Arsenic is a metalloid with a variety of uses, from insecticides to semiconductors to bronze alloys. About 70% of global production is used for industrial wood preservation, in a material called Chromated Copper Arsenate. Domestic Production and Use: There has been no domestic production of arsenic trioxide or arsenic metal since 1985. Imports of arsenic trioxide averaged more than 20,000 tons annually during 2001-03. However, owing to environmental concerns and a voluntary ban on the use of arsenic trioxide for the production of chromated copper arsenate (CCA) wood preservatives at yearend 2003, imports of arsenic trioxide averaged 7,100 tons annually during 2004-08. Arsenic metal was used to strengthen the grids in lead-acid storage batteries and in small-arms ammunition, used by the United States military, was hardened by the addition of less than 1% arsenic metal. Arsenic metal was used as an antifriction additive for bearings, in lead shot, and in clip-on wheel weights. Arsenic compounds were used in fertilizers, fireworks, herbicides, and insecticides. High-purity arsenic (99.9999%) was used by the electronics industry for gallium-arsenide semiconductors that are used for solar cells, space research, and telecommunication. Arsenic may be used for germanium-arsenide-selenide specialty optical materials. Indium-gallium-arsenide was used for short wave infrared technology. The value of arsenic compounds and metal consumed domestically in 2009 was estimated to be about $7 million. Recycling: Electronic circuit boards, relays, and switches may contain arsenic. These scrap materials should be disposed of at sites that recycle arsenic-containing, end-of-service electronics or at hazardous waste sites. Arsenic contained in the process water at wood treatment plants where CCA was used was recycled. Arsenic was also recovered from gallium-arsenide scrap from semiconductor manufacturing. There was no recovery or recycling of arsenic from arsenic-containing residues and dusts at nonferrous smelters in the United States. Import Sources (2005-08): Metal: China, 86%; Japan, 11%; and other, 3%. Trioxide: China, 47%; Morocco, 43%; Belgium, 4%; Hong Kong, 4%; and other, 2%. Events, Trends, and Issues: Since 2004, exports of arsenic metal have increased dramatically and arsenic-containing “e-waste” such as computers and other electronics, destined for reclamation and recycling, may be included in this export category. The exported arsenic metal may also have been used in electronics applications. In 2009, export destinations for arsenic metal were Honduras (76%), Guatemala (10%), and France (7%). The U.S. Food and Drug Administration (FDA) urged caution with ayurvedic products and indicated that these products do not undergo FDA review. Ayurvedic medicine is a traditional healing system that originated in India and includes medicinal preparations that combine herbs with minerals and metals such as arsenic, lead, mercury, and zinc. High exposure to arsenic in drinking water has been linked to the development of diabetes. University researchers have found that the risk of diabetes for Americans with the highest arsenic content in their urine is more than three times the risk of those with the lowest arsenic levels. In response to human health issues, the wood-preserving industry made a voluntary decision to stop using CCA to treat wood used for decks and outdoor residential use by yearend 2003. Because of known performance and lower cost, CCA may still be used to treat wood used for nonresidential applications. Human health concerns, regulation, use of alternative wood preservation material, and the substitution of concrete or plasticized wood products will affect the long-term demand for arsenic. Arsenic contamination of the Mekong River in Southeast Asia reportedly is putting millions at risk of severe illness. Approximately 21% of the Vietnamese population was exposed to arsenic levels above the World Health Organization’s acceptable level of 10 parts per billion. Researchers in the United Kingdom indicated that one-third of baby-food rice for sale in the United Kingdom contained high levels of arsenic. There are no regulations regarding the amount of arsenic in food products; however, drinking water standards are in place in the European Union and in the United States. Arsenic may also be released from coal-burning powerplant emissions. World Resources: Arsenic may be obtained from roasting arsenopyrite, the most abundant ore mineral of arsenic, as well as from copper, gold, and lead smelter dust. Arsenic may be recovered from enargite, a copper mineral; realgar and orpiment in China, Peru, and the Philippines; copper-gold ores in Chile; and associated with gold occurrences in Canada. In Sichuan Province, China, orpiment and realgar from gold mines are stockpiled for later recovery of arsenic. Global resources of copper and lead contain approximately 11 million tons of arsenic. Substitutes: Wood-treatment substitutes include alkaline copper quaternary, ammoniacal copper quaternary, ammoniacal copper zinc arsenate, copper azole, and copper citrate. In humid areas, silver-containing biocides are being considered as an alternative wood preservative. Other CCA-treated wood substitutes include concrete, steel, plasticized wood scrap, or plastic composites. AXT, Inc - manufactures and sells raw materials to the semiconductor substrate industry through joint ventures in China. These materials include arsenic, gallium, germanium, and boron. 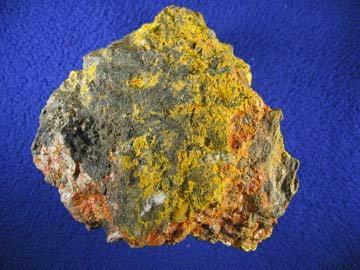 American Elements - http://www.americanelements.com/as.html - Arsenic metal and arsenic oxide.